Last night, B and I headed to Harvey Norman at our favourite shopping centre IKANO specifically to get an air cooler for our home. It's been scorching hot for more than a month and after much discussion, we decided an air cooler would be simpler and cheaper to while away this current heat wave. We already had a model in mind and I was excitedly anticipating a cool night of watching DVD in my living-room with our new portable air cooler. We wanted one with wheels to make it easier for us to push it around our home, wherever needs cooling. Unfortunately, Harvey Norman was all out of the model we wanted and there was no indication when the new stock would arrive. The salesperson claimed he sold the last model just a few minutes ago. Just my luck! 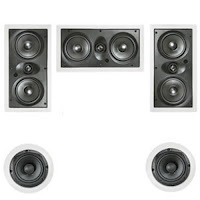 I was quite taken with the home theater speaker system package on sale too. From bookshelf and satellite to in-wall and in-ceiling speakers, it was a massive affair. We've never had a home theater system and I'm referring to the whole works; complete with speakers and subwoofers for maximum impact so I was a little enticed! The set that caught my eye would be perfect for our cosy condo unit. Instead of box speakers, we could opt for high-quality in-wall and in-ceiling lines, which can be used as front speakers due to their unique angled driver configuration. It looked easy enough to install and I was almost sold until B reminded me of our actual purpose to Harvey Norman and that was to get an air cooler and not a home theater system! I was a bit disappointed that we didn't get to buy our air cooler or the cool home theater set but we didn't go home empty-handed. I made a quick stop at the new Durian Pancake stall I recently discovered and even bought a Milk Tea Ice Blended Bubble Tea for good measure. Have you tried the Durian Pancake yet? 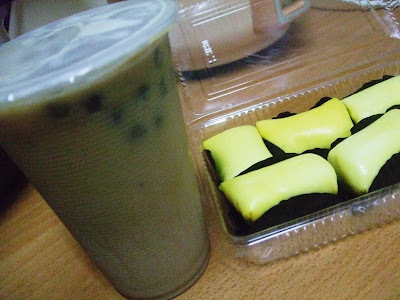 The durian wrap is filled with delicious cream and durian filling...sinfully yummy! Aiyoo.. i want to try lah this pancake.. where to get.. so sedaps!!! Ha ha, try la LJ! Kat Ikano ada stall… I still haven tried oblong burger! Oh ye ke, I don mind durian not bad. And the pancake is very nice, something new. Trying to BD la lol… next time I wan to try lychee bubble tea! MJ and Farah Fawcett, GP! :( I bangun awal, slept early last night. hahaha i only eat the durian fruit. any by products of durian like ice cream, candy, cakes or whatever i cannot stand. LOL! Emmm...Durian PanCake..macam sedap je ni!!! Power juga JS-kit boleh link dengan twitter ya!!! Denaihati, mmg best pun, cuba lah! Mcm menarik gitu this pancake, tu yg ada repeat performance from me ha ha! Morning Shemah! I slept late and woke up late too huhu! emm looks so good have a great Friday I have my 6 year old grandson and it's going to be a fun day. Even in Norway, we could need an AC today. Almost 30C. so were you able to get one cooler now? aiyoo i oso want to try this!!!!! where is the Durian Pancake stall Mariuca? I think so Mon, me and my posting frenzy! Ha ha try la Mon, can get at IKANs (IKANO)! It’s next to the rojak stall and the choc stall, same floor as the 15 dollar hair cut for 15 minutes shop! It’s at B1, same floor as uncle lim’s! Ok check it out, this one here is RM10 but can try 2 first for RM4..
Long time no eat Uncle Lim’s bored with UL edi! 2 sure not enuff for me ....hahhahahaha! LOL Ikans and One Uts..my fave! I recommend the RM10 one then LOL!! The smell is not that strong as the fruit itself Ayie but it’s unmistakable. Be brave and give it a shot LOL! Wow to ECL making durian rolls, I oso want! Wah, now I feel like some durian tonight ECL!